The Flat season drew to a close today for amateur jockeys with SIMON WALKER securing the gentleman’s championship several weeks ago having forged clear of his rivals and finally completed the season with a magnificent total of 10 wins. MARCUS PRICE was his nearest rival on 3 wins and takes the vice-champion slot. This is no less than Simon’s 6th Gentleman’s Flat Amateur Championship (2003, 2004, 2006, 2007, 2008, 2009) as well as him being the current All-Weather Amateur Champion and is an extraordinary performance. The ladies title was a less predictable challenge with SERENA BROTHERTON also enjoying a fantastic season and taking both the Ladies Derby at Newbury and the inaugural running of the Ladies Derby at Epsom. However, with three lady jockeys – VICTORIA BARR, WENDY GIBSON and PIP TUTTY – all on a total of 3 winners to Serena’s total of 4 in recent days, there was an exciting end to the season but Serena’s win last Saturday at Newbury of the Frank Osgood Memorial took her total for the season to 5 wins and secured her the third ladies Flat championship of her career (2005, 2006, 2009). This is a terrific achievement for Serena and congratulations must go not only to our 2 new champions but also to all amateur jockeys who have ridden winners this season. Today at Musselburgh the mixed amateur riders’ race saw the final appearance in the saddle for the time being of past triple lady Flat amateur champion CAROL BARTLEY (2001, 2002 and 2003) as she takes maternity leave from her illustrious career. 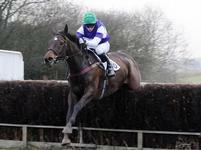 Carol is the most prolific winning lady Flat amateur jockey holding a licence, with a career total of 52 wins so far. Newbury’s Frank Osgood ladies race today, won in fine style by Serena Brotherton to take her to a total of 5 wins this season and 2 clear of her nearest rivals, was not without incident. On only his 2nd racecourse appearance, 18-year-old Daniel Hiskett rode his first winner under Rules when scoring on LOVE OF TARA for Martin Keighley in the opening amateur riders’ novice hurdle today at Exeter.This followed a great weekend for Daniel when he led up Benbane Head at Cheltenham for his guv’nor and enjoyed seeing him win. Congratulations to Dan on a great start to his career! The BHA has announced the introduction of a new whip for jockeys but the good news for amateurs is that they are exempt from this change. The modified whip, which will include a microchip to allow research into the whip’s cushioning longevity, will be made available to British professional jockeys over the next few months, firstly on the Flat. Modifications have also been made to the grip. 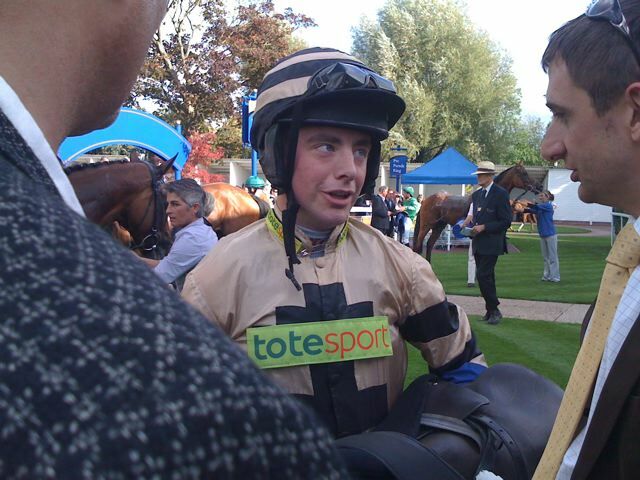 Ian Chanin, Great Britain’s Fegentri gentleman representative (pictured talking to trainer Jim Boyle after winning at Windsor in August), has broken his leg in 5 places whilst schooling at Polly Gundry’s on Friday. With 4 races remaining in the Fegentri calendar and not far off the leaders, but even more significantly just approaching the start of a new point-to-point season with a long list of rides, this is awful news for Ian and we all wish him every good wish for a speedy recovery. Currently in Exeter Hospital, Ian has had an operation to insert steelwork and now with a pin and numerous screws he hopes to be home soon to continue his recuperation. GET WELL SOON IAN!